Found 2 file extension associations related to XS and 2 file formats developed specifically for use with XS. XS is a first-person shooter released by SCi and GT Interactive. 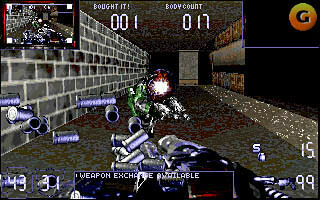 While not a runaway success, the game introduced many aspects (like shielding) which were later used in games such as Unreal. The game is set in the far future during a gladiator style blood sport. The main character was told about the event from an associate who is believed dead at the start of the game. You must fight through a number of rounds of Free for all deathmatch style combat, choosing a pair of weapons to use before the match begins. The battles are to the death with the corpses of the losers used as meat for fast food burgers. After defeating all the enemies your associate reveals himself and murders you, taking the prize money for himself. If you need more information please contact the developers of XS (Atari, Inc.), or check out their product website.